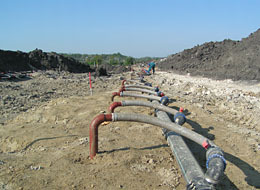 During our projects, we often have to work under groundwater level. Should jacking pipes or even sewer pipes or other utilities to be rehabilitated be installed under groundwater level, we must be able to offer a technically perfect, reliable groundwater lowering technology. 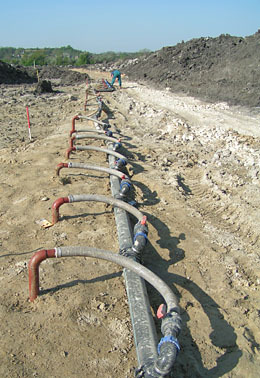 Considering the average soil conditions in Hungary, vacuum dewatering is the most commonly used technology. Maximum level of groundwater dewatering depends on the soil permeability and the distances between vacuum wells. With appropriate equipment and careful execution, 4-6 m of groundwater lowering can be reached in one step. In case of dewatering of deeper construction pits, vacuum well systems shall be installed in multiple steps for the desired results. In the meantime, Sycons Kft. 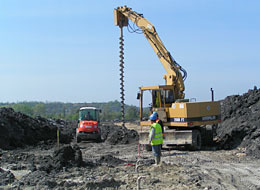 uses other technologies too for construction pit dewatering, according to the given geotechnical conditions.